Leonard, William, John, Herbert, Ernest, Reginald and father, Walter, the Love family, butchers of Chippenham, all safe and sound. What a lovely conclusion to all the WW1 commemorations this year, an exhibition which celebrates those who came home safely, as well as recording those who died or were injured. 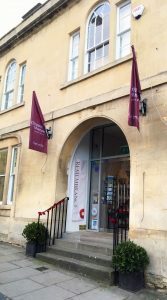 Chippenham Museum’s ‘Remembrance’ was a modest but moving tribute to those from the town who served at the Front. 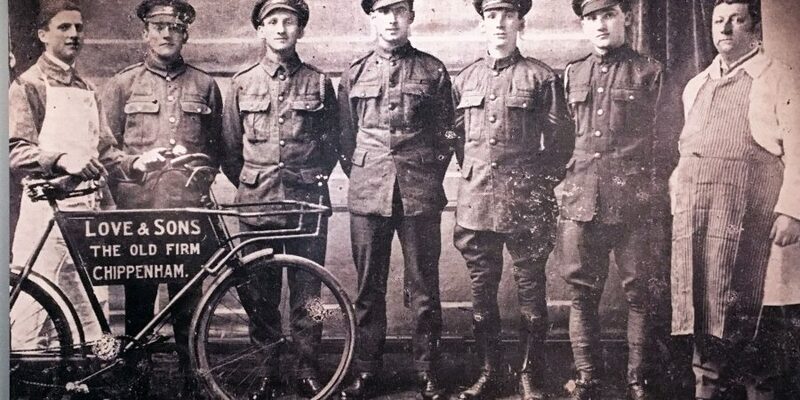 There were six Love brothers – the youngest son, Leonard, was too young to enlist and stayed to work in the family business. This started as a fishmongers in The Causeway in 1899 and then they moved to New Road where it expanded into grocery and butchery. His five brothers joined up and all returned unharmed. 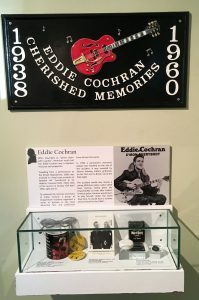 At the other end of the spectrum, in the general gallery of exhibits, are displays connected to the 1960s and Eddie Cochran, rock and roll singer, born 1938, aka ‘James Dean with a guitar’. Sadly, unlike the Love brothers, he did not return home safe and sound. Cochran died in St Martin’s Hospital, Bath from severe brain injury, the day after a road accident on Rowden Hill, Chippenham, 16 April 1960. He was appearing at the Bristol Hippodrome on the final stage of his UK tour with Gene Vincent. In remembrance, the annual Eddie Cochran Festival was started in 1994 by The Eddie Cochran Appreciation Society. It celebrated its 10th anniversary in 2004, was cancelled for a few years, and revived in 2016.